MILWAUKEE — The Milwaukee Brewers' lineup offered no relief to the New York Mets' battered bullpen. Domingo Santana's two-run double off Paul Sewald highlighted a four-run seventh inning for the Brewers, who shelled Mets relievers again before holding on for an 8-7 win on Sunday. The NL Central leaders won their fifth straight series by taking three of four games from the struggling Mets. 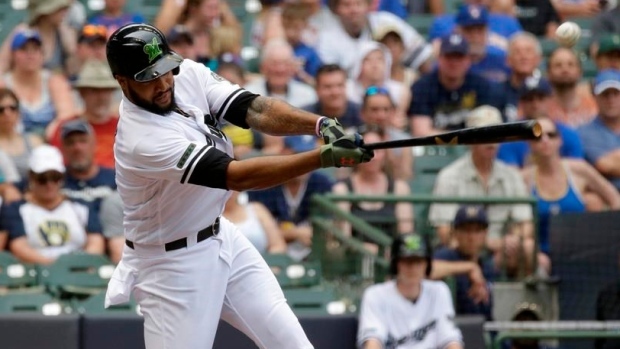 Jesus Aguilar added a three-run homer and four RBIs for the Brewers, who trailed 6-4 before teeing off on three relievers in the seventh. "Everything is going well. We are connected," Aguilar said. "We have to keep fighting there and a lot of good things are going to happen." After Robert Gsellman walked Aguilar to put runners on first and second with two outs, Jerry Blevins (1-1) gave up an RBI single to Travis Shaw. It was the kind of spot in the game that the left-handed Blevins has built his career around, specializing in retiring tough lefties such as Shaw. "It's a little hard for me to speak on behalf of the bullpen right now. I don't think I've been this angry with baseball in a while," Blevins said. Manager Mickey Callaway lifted Blevins after one batter for Sewald, but the righty allowed Santana's flare down the right-field line that landed for the double that scored two to make it 7-6. "I'm so glad that the slider caught the end of my bat and landed fair," Santana said. Jonathan Villar drove Santana home with another double. Milwaukee got to the Mets' bullpen again after tagging New York relievers for eight runs and 13 hits in a 17-6 rout on Saturday. "It's kind of rough when you start scoring some runs and then you give up runs," Callaway said. "But, that's how it's been and we need to change things. We need to play better all around." The Brewers won for the sixth time in seven games, but endured their own nervous moments late when struggling closer Corey Knebel gave up a solo homer to Devin Mesoraco in the ninth to draw the Mets within a run. Knebel then walked potential tying run Amed Rosario, who stole second. But Knebel struck out Asdrubal Cabrera and Michael Conforto on fastballs to end the game for his fourth save. "That was important for Corey, for sure. He needed that," manager Craig Counsell said. Boone Logan (1-0) was credited with the win despite giving up Cabrera's solo homer in the seventh. Mets: Zack Wheeler struck out six and allowed four runs and six hits over six solid innings, throwing a season-high 110 pitches. Brewers: Jhoulys Chacin settled down after a rocky second inning when he allowed four runs and five hits. He allowed three hits and one run for the rest of his outing before leaving with one out in the seventh. "It could have been worse but he limited the damage," Counsell said. Mets: 3B Wilmer Flores left the game before the bottom of the fourth with lower back soreness. Callaway said after the game that Flores would fly back to New York to get checked out by a doctor. "I'm sure you guys have seen him having a tough time throwing the ball, he feels like he can't really bend over," Callaway said. RHP AJ Ramos, who has allowed eight runs in his past 4 2/3 innings, flew back to New York after complaining of right shoulder tightness following the 17-6 loss on Saturday. Ramos allowed three runs in two-thirds of an inning in that game. ... Assistant GM John Ricco said that C Kevin Plawecki (left hand) and RHP Hansel Robles (right knee) were headed to Atlanta, where they might be activated from the disabled list to rejoin the club for the doubleheader Monday against the Braves. ... 3B Todd Frazier (left hamstring) was headed to Triple-A Las Vegas. Ricco said he was making progress and could start a rehab assignment soon. Mets: RHP Jacob deGrom (4-0) is scheduled to pitch the first game of a doubleheader in Atlanta. The Mets did not announce who would pitch in the second game. Brewers: LHP Brent Suter (4-3) opens a three-game series against the visiting Cardinals. Suter is 0-2 with a 3.80 ERA in seven games, including three starts, against St. Louis.